The Local Governments and the Sharing Economy roadmap is being shared by our partners and by the press. This is a selection. We're grateful for your support in bringing these findings to relevant audiences. 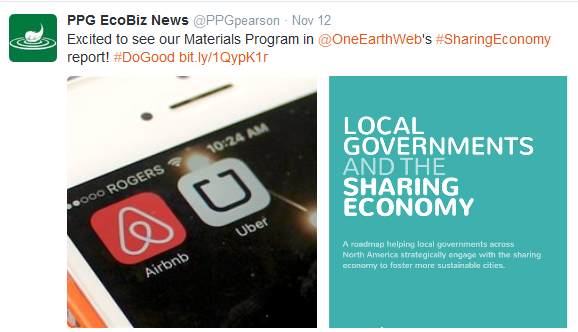 The Sharing Economy could be transformational for the UK. So why are we lagging behind? - by Alexander Hardiman - published as a blog here on Left Foot Forward - 15 Dec 2015. Novae Res Urbis - published an article "Sharing Economy Opportunities: Taking Advantage" (by Leah Wong). This PDF is posted with permission of the publisher of NRU Publishing Inc. Original article first appeared in Novae Res Urbis – Toronto Edition, Vol. 19 No. 45, Friday, November 13, 2015. 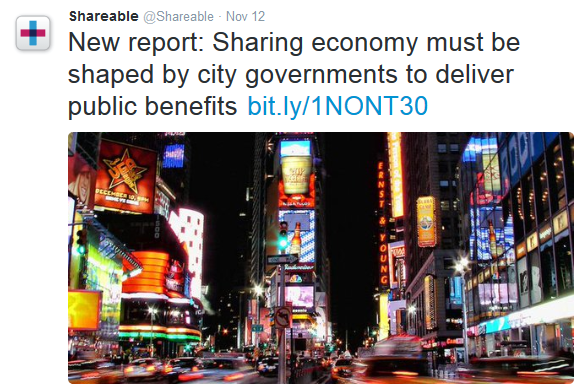 Shareable - Blog post about the report here by Cat Johnson (9 November). Cities for People - The lead authors published a blog on the Cities for People website. Roundhouse Radio: Lead author Rosemary Cooper was a guest of Roundhouse Radio on HOME with Jana Lynne White (Monday 16 November). 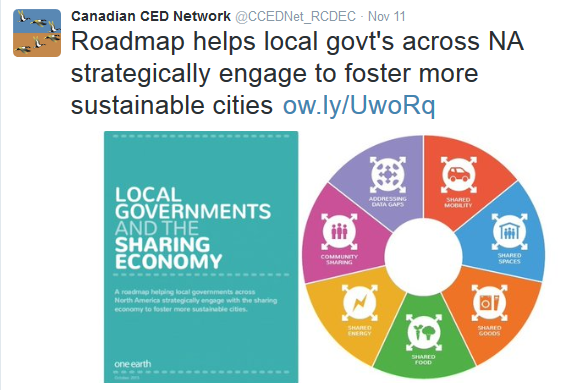 The Local Governments and the Sharing Economy report has been shared through newsletters including the following: Sustainable Consumption Research and Action Initiative (SCORAI), Shareable, CCEDNet, the J.W. McConnell Family Foundation (November newsletter - article here), Cities for People, the Post-Carbon Institute (see link), and others. It was distributed on the listservs includng: Sustainable Consumption Research and Action Initiative (SCORAI), New Economy Coalition, Global Research Forum on Sustainable Production and Consumption (GRF-SPC), SEA Catalyst, Columbia Basin Trust, and others. It has been posted in resource repositories including: Cities for People, Pando - Sustainable Communities, Post-Carbon Institute (see link) and others.